Chocolate chip cookies are delicious, but they are even more so when crispy bacon is thrown into the mix. These cookies are over the top. Don’t run away screaming. 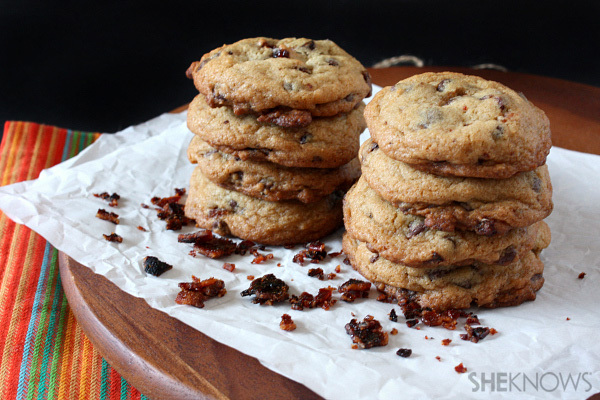 This delicious cookie combines two of the most delicious foods in the world: chocolate and bacon. Oh and this not your average bacon. We coated it in brown sugar and baked it to create a perfectly crisp and sweet candied bacon treat. In a medium mixing bowl, whisk together flour, baking soda and kosher salt. In the bowl to an electric mixer, add butter, white sugar and dark brown sugar. Mix together until butter and sugar are fluffy, about 3 minutes. Add in vanilla extract and eggs. Mix until combined. Slowly incorporate flour mixture until completely combined. Mix in chocolate chips and candied bacon. Add drops of dough the size of 2 tablespoons to a parchment-lined baking sheet. Leave about 3 inches between cookies. Bake for about 8-10 minutes until lightly golden brown. Let cool on the tray for a few minutes and then move to a cooling rack. Continue until all the cookies have been baked. Preheat oven to 350 degrees F and line a rimmed baking sheet with parchment paper. In a shallow dish, whisk together dark brown sugar and cinnamon. Coat each slice of bacon with brown sugar mixture and lay on prepared baking sheet. It’s OK to keep the slices close together because they will shrink up a bit while baking. Once fully coated, add the bacon to the oven and bake for about 25 minutes until the bacon is crisp and the sugar has created a candy shell over the bacon. Once cool remove and break into pieces. Do not remove hot bacon from tray and lay on a paper towel. The bacon will cool and stick to the paper. If you remove bacon from the tray, move it to another piece of parchment paper or a clean Silpat.